The first item that I identify as a Granary Books publication was actually published by Origin Books in 1986—Wee Lorine Niedecker by Jonathan Williams. It embodies several elements that remain important to me now, some fifteen years later, among which is an acute awareness of the “book” as a physical object. I write this in quotes because the work in question is not a book per se but presents a short poem by Mr. Williams, printed on a small piece of card stock contained within a printed envelope which is enclosed within yet another printed envelope. As such, its references include Williams’ own Jargon Society (‘the custodian of snowflakes’), a press which made ample use of a diverse array of publishing formats including folding cards, broadsides, postcards, pamphlets, and books. The Jargon Society was one of two or three publishers which loomed behind the emerald curtain at the fore edge of my imagination as possible exemplars for an entity which had not yet been conceived. 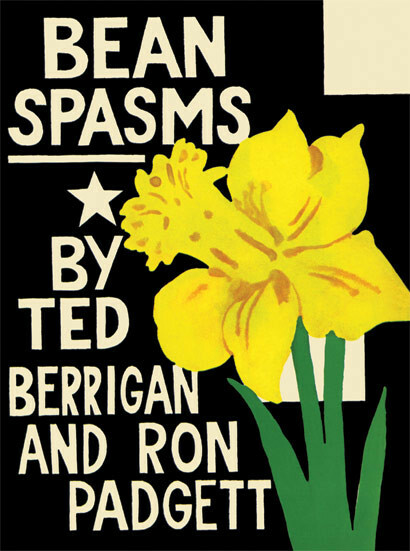 Ted Berrigan, Joe Brainard and Ron Padgett's Bean Spasms is the defining publication of the 1960s literary/Pop scene in New York. Originally published in 1967 by Kulchur Press in an edition of 1,000, and out-of-print for more than 40 years, Bean Spasms is a book many have heard about but relatively few have seen, and which—until now—has been shrouded in legend. The text is comprised of collaborations between poets Ted Berrigan and Ron Padgett, with further writings, illustrations and cover by artist and writer Joe Brainard. The three began collaborating in 1960, and kept a folder of their works titled "Lyrical Bullets" (a humorous homage to the well-known collaboration between Coleridge and Wordsworth, "Lyrical Ballads"). As Ron Padgett describes, in his introduction to this new facsimile edition, their collaborations included "plays, a fictitious correspondence, a picaresque novel, goofy interviews and poems of various types and lengths, as well as mistranslations and parodies of each other's work and the work of others." Poet friends dropping by during writing sessions would also add lines, and although Berrigan and Padgett also contributed visuals, and Brainard contributed texts, all works in the book were intentionally left unattributed. Full of wild wit and joy in experimentation, competition and collaboration, Bean Spasms is a classic document of the New York School.